Everybody has played Halo, and those who haven’t played Halo know someone who has Halo, and those who don’t know someone who has Halo, are Amish. So when it was announced that the super Bungee franchise would be converted to a anime cartoon release, it was met with much nerves and celebration. Finally though the release is upon us, and fans of the game and anime can celebrate a like. 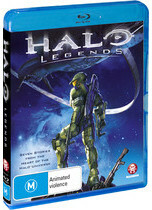 Being helmed by some big names such as Production I.G, Toei Animation and Studio Bones, the Halo Legends episodes help transform the Halo universe to a new creation and expand on the already enormous fandom through some sharply created anime productions and creative story lines. Initially set after the storyline of Halo 3 finishes, Master Chief and his assisting Cortana are stranded on their ship, Forward Until Dawn, Cortana narrates the story of Master Chiefs origins, the Spartans demolishing combat abilities, and ultimately the tense rivalry between the Spatrans and the ODST (Orbital Drop Shock Troopers). The film is split into eight episodes of around twenty minutes length each, which perfectly contains each episode while still maintaining a keen interest in wanting to start the next episode instantly. hrow this together with the fantastic ‘making of’ extra’s that runs for fifty five minutes alone, and this is a complete package. Truly this is a great release, it will appease fans of the franchise, fans of anime, and general animation fans. The feature will do miles more for the Halo universe then previous attempts such as The Animatrix or the Street Fighter releases have ever done for their respectable franchise and more importantly it ensures that not only do you want to watch it over again, but you want to play the games, buy the figures and wear the t-shirt. Mission accomplished.